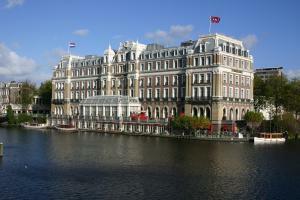 The InterContinental Amstel Amsterdam is the most prestigious hotel of the Netherlands. The stately hotel elegantly dominates a quiet, though central section of the Amstel River bank and is within walking distance of the Dutch canals.Each luxury suite and executive room is perfectly suited for business or pleasure and is fully air-conditioned. The restaurant ‘La Rive’, a Michelin Guide listed restaurant, continues a long tradition of excellence in cuisine.Guests can relax in the fully equipped Health & Fitness Club, located at the river level with a beautiful view of historical bridges.As the Amstel enjoys a special location on the riverside, three authentic canal boats are available to guests wishing to tour the beautiful and renowned canals of Amsterdam. The elegant, tasteful design and the distinguished, traditional character of our six banqueting rooms make the Amstel Hotel an ideal place for even the most exclusive receptions and business meetings of Amsterdam. Its concept ‘from boardroom to ballroom’ makes the Amstel Hotel the perfect location for meetings for up to 180 persons, receptions for 350 guests, a dinner or cocktail for 175 persons or an intimate lunch for 10 persons. Thanks to its spectacular interior, the Mirror Room (Spiegelzaal) is the most distinguished ballroom in the capital. The six banqueting room of course all have daylight and most offer a wonderful view of the Amstel. All rooms are, moreover, equipped with state-of-the-art audiovisual aids and telecommunication equipment. The hotel also has a business centre, while access to high-speed Wireless Internet is available all over the hotel.